To ensure customer safety and extend product life, tire manufacturers are moving to 100% tire inspection. This QTM strategy includes tread depth measurement and defect detection. Shallow tread depths shorten service life while defects such as blistering, bubbles, and overlapping belts can lead to runout, road noise, vehicle suspension vibration or worse – catastrophic failure. Many of today’s all-season tires feature asymmetrical tire tread patterns. Designed to meet the conflicting requirements for dry grip performance as well as water dispersal, an asymmetrical tread pattern changes across the face of the tire. Larger tread ribs on the outside, for example, improve cornering stability on dry roads. Smaller independent tread blocks on the inboard side increase traction under wet or winter conditions. Full tire inspection requires a non-contact sensing system capable of “seeing” the tire’s total tread width. In addition, the system must accommodate tire rotation to capture full pattern layout. Users want to realize these objectives with a trouble-free cost-effective sensing system that is easy to implement and operate. The ProTrak G high-resolution profiling sensor from MTI Instruments meets the requirements for go/no- go tire inspection. Designed for automation and process monitoring, ProTrak G 2D laser sensors use the triangulation principle to obtain a two dimensional height profile of target surfaces. During operation, the sensor’s laser line generator projects a diverging line that has a beginning dimension of starting range X and maximum width dimension at end of range X. The line is diffusely reflected back onto a CMOS camera array through focusing lenses. Internal electronics convert the CMOS line profile to an X-Z array output for the display software. Moving the sensor along the target allows the application software to build a 3D image of the target. A built-in laser head encoder interfaces to a rotary encoder connected to the tire, synchronizing tread pattern to angular position of the tire. Measuring rate is 4,000 frames per second while measuring range can reach 400 mm. ProTrak G™ high-resolution profiling sensor from MTI Instruments provides tread depth, blister, and sidewall profile data for go/no-go tire inspection. 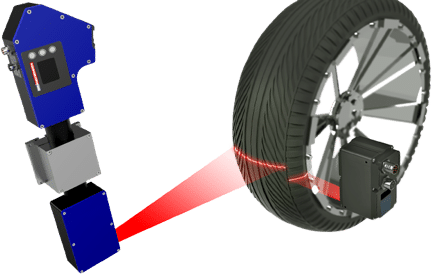 Non-contact sensors are ideal for tire tread measurement (Watch our video to see how it works) and other moving targets because they offer high frequency response and do not dampen target motions by adding mass; automatic intensity control eliminates the need for manual adjustments. ProTrak G 2D laser sensors also feature GigE camera standard interfaces over Ethernet and optical character recognition (OCR) software. Besides tread depth, users can read bar codes and sidewall profile data. Measuring tire tread depths. Note some all season tires have asymmetrical thread patterns. So you will need to rotate the tire to get the full pattern layout. This was done with a MTI PT-G 190/62/145 using red laser. 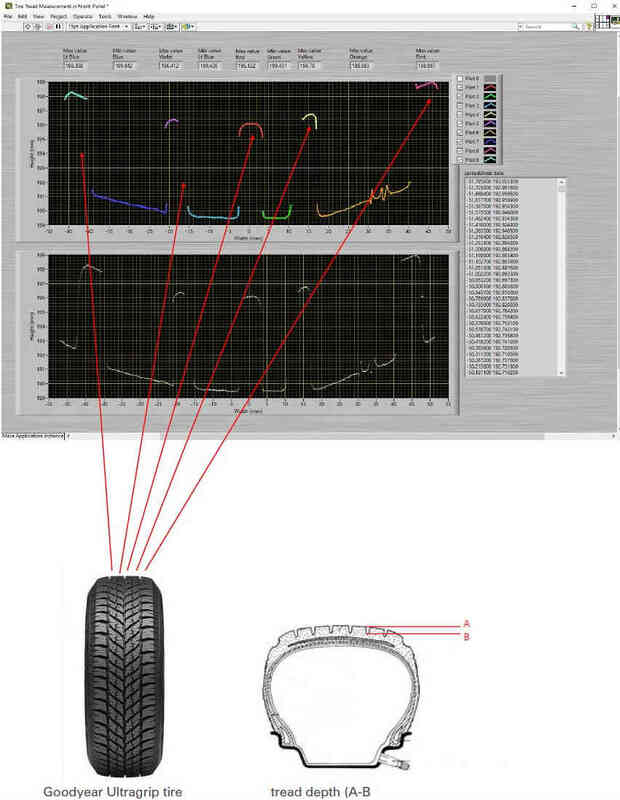 The 2D laser head encoder inputs can interface to a rotary encoder connected to the tire to keep track of the 0-360 pattern of the tire as its rotated. This will synchronize the thread pattern to the angular position on the tire. 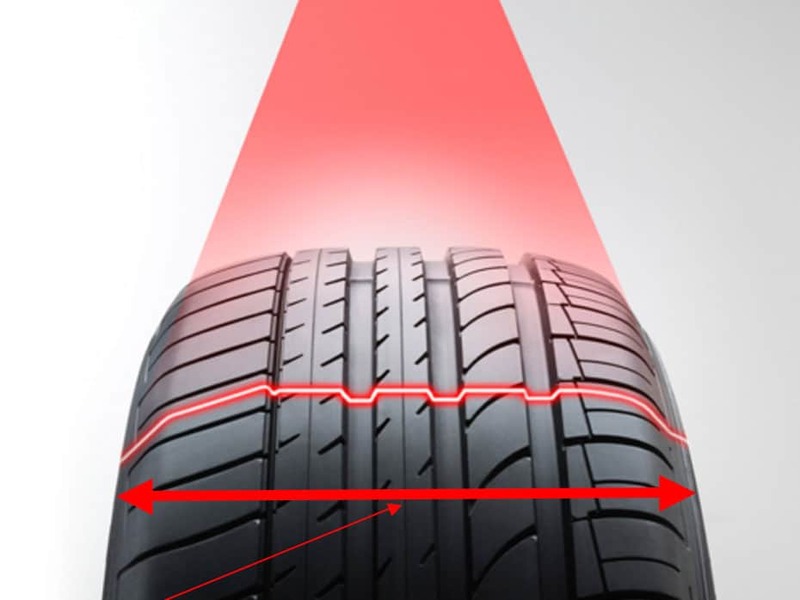 Choose a laser head that has sufficient X range to see the whole tire pattern as shown. Choose sufficient X width for the 2D head or shift the 2D head laterally to image the complete tire over multiple rotations. Watch video of tire tread measurement with 1D Laser Sensor.